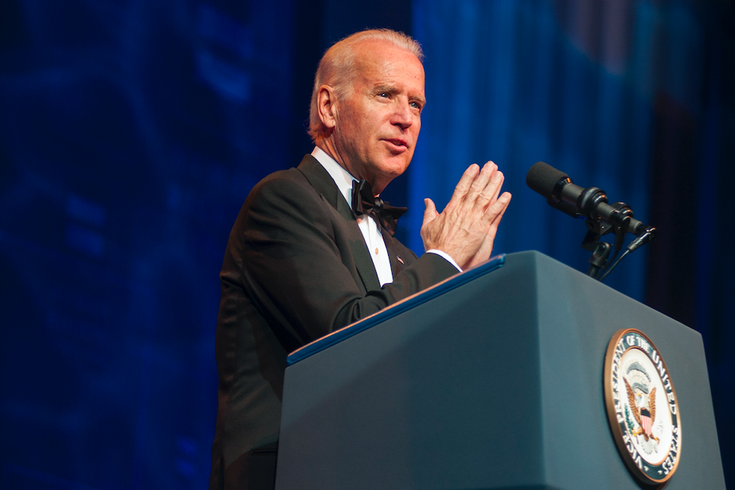 Joe Biden gives a speech at the HRC Los Angeles Gala on Saturday, March 22, 2014. Some tickets still were available Thursday to see Joe Biden in Philadelphia next week. The former vice president is set to talk politics, his career and his son's death when he appears at the Kimmel Center at 7:30 p.m. next Wednesday as part of his ongoing book tour, held in conjunction with the release of his memoire, "Promise Me, Dad: A Year of Hope, Hardship, and Purpose." The book, which comes out Tuesday, is centered around the May 2015 death of Biden's son Beau from cancer, and how losing his son inspired Biden to find a "new purpose in a time of uncertainty." The longtime U.S. senator from Delaware plans to share the discussion with Aaron Sorkin, the Academy Award-winning screenwriter and playwrite behind television series like "West Wing" and "The Newsroom," as well as "A Few Good Men," "Moneyball" and other films. The admission price, which ranges from $80 to $135 per person, includes a copy of Biden's memoir.